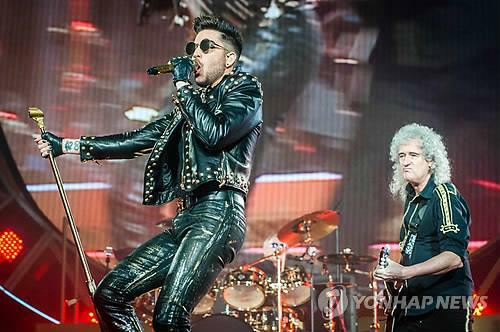 British rock band Queen will soon hold concerts in South Korea, after “Bohemian Rhapsody,” a biographical film about the iconic group, reignited the group’s popularity worldwide and especially here, organizers said Tuesday. “Queen is going to perform in South Korea sooner or later. We’ll soon release the exact date and place of the event,” a PR official with AIM told Yonhap News Agency by phone. On Monday, the concert agency uploaded a promotional video for the upcoming concert with the message “World Tour in Korea Coming Soon” on its Facebook and Instagram accounts. Considering that the band is set to have a North American tour in July and August, the Korea visit is expected to fall shortly before or after that. The band’s lead guitarist, Brian May, said in a video uploaded to a Universal Music social media account on Feb. 19 that he will meet his Korean fans soon. If realized, it would be the band’s first performance in Korea since their participation in the Super Sonic music festival in 2014. The film “Bohemian Rhapsody” has attracted an audience of more than 9.94 million people in South Korea.